I am revisiting my love of teen-horror romances circa the 90's -- long before "Twilight" was a blip on anyone's radar. Back in the day, when all I read were haunts by Christopher Pike and R.L. Stine (which were able to come out almost monthly), I stumbled upon an author named L.J. Smith. She was a master of the Trilogy. What pulled me in, and what I would love to read again someday, was "Dark Visions." A book about kids with psychic abilities and their war against some man who wanted to use their powers for evil. After I fell in love with that series, she started publishing "Night World." A 10-book whopper that chronicled the lives of vampires, witches, shape-shifters and other "creatures" that had to live secretly among the human population. Each book chronicled a "Night Person" that fell in love with a human and they were evidence of the "soul mate principle" that was configured in the coming of some great millennial war. Each book, which mentioned in passing other characters from other stories, were practically stand alones. These books didn't have re-occurring characters like the typical series. Instead, you relied on back story to build and build. In order for the other stories to make sense, you had to read them in order. Sadly, Book 10 never came out. It is rumored that, with the republishing of all her novels in the post-"Twilight" world of horror romance, it will finally come out. But I'm not holding my breath. So, instead, I have been checking out each audio book from my digital library and listening to them as brainless pleasures on my way home from work. 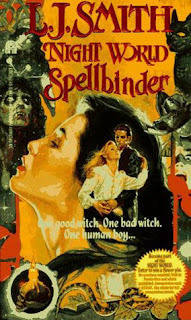 The latest, the third in the series, was "Spellbinder." Two "sisters" witches (born the same time of sisters, so they are actually cousins) move to Las Vegas to live with their Crone Grandma because one of them keeps getting them in trouble by creating boy toys -- that would be Blaise. Then, one unsuspecting day, Thea, her cousin/sister saves a human boy from a snake bite and she has found her soul mate. Understand, this is not good. Humans can not know of the Night World, nor can they fall in love with humans. It is punishable by death for both parties. So, when Thea comes to terms with her predicament, it is no small undertaking. Blaise sees this and decides to help Thea out by trying to get the boy to fall in love with her instead, using a crazy amount of spells. Each and every one bounces off of him. Thea tries spells herself, but it doesn't work. In the meantime, while both Thea and Blaise are working their magic (and it's more herbs and stones, not lightning shooting out of their fingertips), Thea decides to use a Forbidden Spell that only elders can use. This releases a mean spirit into the world. Oops. This mean spirit kills a human boy at the high school they attend. Now, Thea is panicked because there is blood on her hands. What's a teenage girl to do? Not only has she used a Forbidden Spell that has caused a death, but she's also in love with a human, and now she has to send that mean spirit back to the other side of the veil. It isn't brilliant. It's somewhat predictable, but what I find interesting is how Smith begins to weave together the underlying story of how the Night World is beginning to change and how humans and Night People are beginning to fall in love with each other, like it's an omen of things to come. When those pieces of the story are revealed, I get a little giddy. Sadly, they are small snippets. But, it's enough to move forward to the next book, since I have forgotten how it plays out.